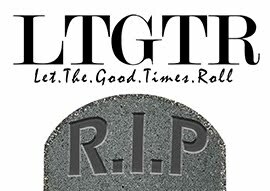 Last issue, we told you about the activities of the TGC Amity Delhi Chapter. This time we go down south to Thanjavur and talk to the TGC Chapter there. TGC Thanjavur chapter recently visited a government school and interacted with the kids. 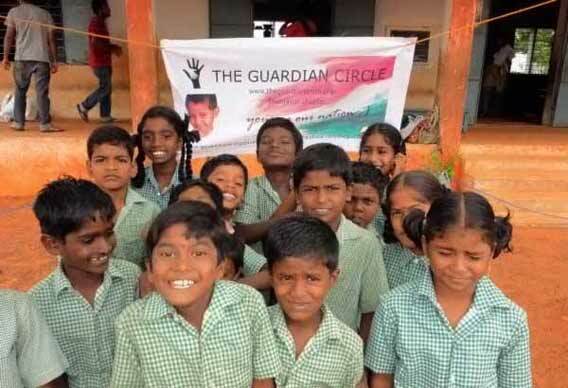 The Guardian Circle is an initiative taken by students to help give back to society. It is an NGO which fully understands the importance of education. However, they are also aware that some children cannot afford it. TGC strives to fund such financially handicapped children so that they too can have the opportunities rendered unaffordable by their financial state of affairs. Q. What was the event about? What kind of activities did you organize? The main aim of the event was to help the students of PUNIDHA ANTHONIAR School by providing uniforms which they were apparently lacking and make their learning experience interesting by giving them crayons and other stationery items. We also wanted to create awareness among the students with respect to the environment. So, in that respect, we played an animated video that shows the ill effects of pollution, deforestation and usage of plastic. We also taught them how harmful consequences can be prevented by recycling and tree plantation. We conducted a drawing competition as well to make the event entertaining. The students showed great enthusiasm throughout. We concluded with a tree plantation session. Q. Why did you choose that particular school? The primary reason for selecting that school was because it is near our college and is the most under-developed school in the locality. It has only two class rooms for classes I through to V. One can imagine the way classes would be held for all of them together. Q. How many of your volunteers were present? As TGC-T (the Thanjavur chapter of TGC-India) is newly formed and this is our first event, we had few volunteers. Nonetheless, we had good number of supporters for the cause. We were a group of 9 students all from SASTRA University. Q. Were there any difficulties you faced during the organization of the event, particularly with respect to funding and co-ordination? For funding the event, we the volunteers of TGC-T invested money initially and then approached people who were willing to donate for the cause. We received donations from several students in our college. Planning and work distribution were done 5 days in advance. We have two girls among us who local language Tamil fluently and so it was their job to communicate with the students on the day of event. 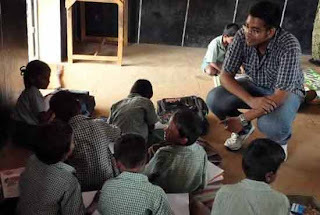 Other members indulged themselves in interacting with the students and help them learn something by different means. It was not too difficult to organise it as this was a comparatively smaller event involving a fewer number of people. Every team member was aware of his/her responsibilities and executed tasks to perfection. Q. What was your aim? Do you think you’ve been able to achieve it? As mentioned earlier, our main objective of the event was to provide the students with new uniforms and secondly give them necessary stationery equipment that they require. We were able to achieve it and we can say that with pride because the feedback given by the students and the teacher was satisfactory. Q. How was the experience with the kids? Was there something that particularly stood out for you? The one sentence that everyone in the team had after the event was “Today’s the best day of my life!” The experience was so great that we are unable to express in words. We actually enjoyed ourselves and felt the joy of giving. It gives us the motivation we need to continue working towards our final goal. Q. What kind of activities do you plan to hold in the future? We’d like to spread the cheer by celebrating Diwali at an orphanage nearby. We also have decided to visit a children’s cancer hospital to do what little we can to make their lives that much better. Q. What kind of impact did this even have on you personally? The whole team was just moved by an incident which took place at our first event. A kid coloured his apple diagram violet. When asked why he had coloured his apple violet he answered in the most innocent way, “I have never seen an apple.” One tiny statement that rendered our whole world topsy-turvy for a while. Q. How many members do you have in the TGC Thanjavur Chapter? We have 12 enthusiastic guardians including me currently .We made our presence felt through social networking. Spreading the word to acquaintances and friends. Q. Is it only in SASTRA university or outside colleges too? We are just a fledgling organization right now. But we have the backing of TGC-India and the Head Quarters in Hyderabad and that’s a start. We will cover all the colleges in our district in the near future. The publicity blitz is on. Q. How did the Thanjavur chapter start? How long has it been in existence? Most of our team are active part of NSS. 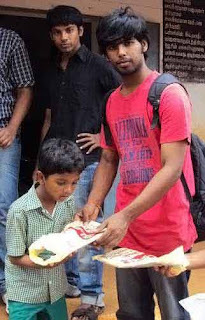 We thought why not start an organization which could really help the needy on a regular basis and is a sustained manner, unlike the NSS which was organized once per academic year by our college management. Q. Have you undertaken any activities before? Most of our core team is a part of NSS organized every year. But this is our first independent effort and it sure is a start. 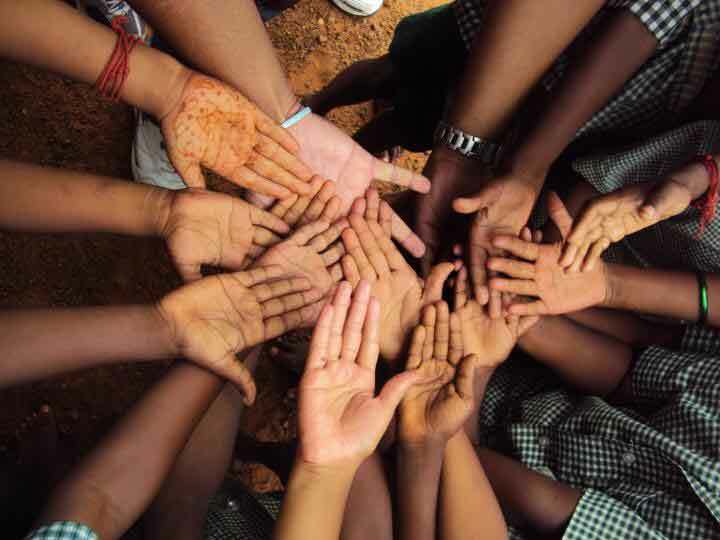 We look forward to expanding our workforce and helping as many under-privileged children as we can.